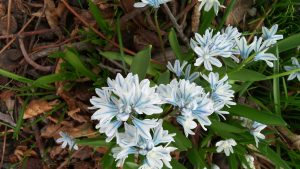 I love blue flowers and have created a blue flower garden in the past. In my soils some look more purplish blue than true blue. For this list I chose some that are more blue than purple. Blue adds a coolness which can be wonderful in the hot summers. Blue also contrasts nicely with orange, yellow, or white. I don’t plant orange flowers in my yard (just my personal taste) so I pair blue with white and possibly pale yellow. For the annual shade garden deep blue lobelia and white impatiens are amazing. Bachelor Button or Cornflower – annual flower, reseeds so you may not need to plant it again. Also in burgundy, pink, white, and purple. Balloon flower – flower looks like a balloon until it fully opens. Also available in white. Bell flowers – many types of Campanula come in shades of blues, purples, whites, and pinks. Borage – this annual or biennial herb has blue, edible flowers which can be used in salads, floated in punch bowls, frozen in ice cubes, or used in other decorative ways. Reseeds. Brunnera – a large leaved groundcover for shade has forget me not like flowers in the spring. Could be a good substitute for hosta since slugs are not as fond of the rough leaves. 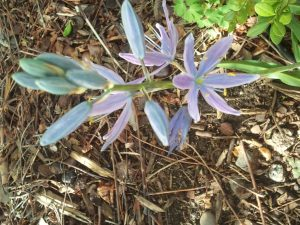 Camas – this native to the Western U.S. is a later blooming bulb in the garden. Although it has an edible tuber it must not be confused with Death Camas which has a white or pale yellow flower and as the name suggests should never been eaten. 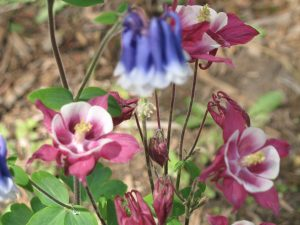 Columbine – another favorite plus the state flower of Colorado where I grew up. Available in many other colors including white, purple, and combinations of colors. Delphinium/Larkspur – although some flowers on this page have parts that are edible delphiniums and larkspurs should never be eaten. Delphiniums blue flowers vary from pale blue to cobalt blue and are also available in other colors including white and purple. Flax – the native Utah flax is blue flax. The seeds can be eaten like other flax seeds. 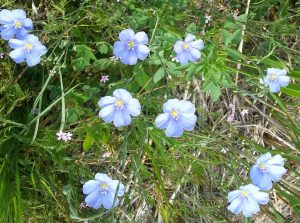 Forget-Me-Not – state flower of Alaska where I lived for a time. Hydrangea – in alkaline soils the soil must be acidified or your blue hydrangea flowers will turn pink. The plant will survive – only the flower color is affected. Sulfur from garden centers can be added for acidification. 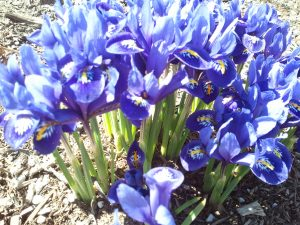 Iris – Iris reticulata in spring, Dutch iris in late spring, German (including the dwarf German iris) and Siberian iris in summer all come in some form of blue or bluish purple. Lobelia – various shades of blue in annual and perennial varieties. The perennial is also available in red, the annual in purples and white. Morning Glory – not bindweed a perennial weed but an annual vining plant with large flowers. Also white, purple, and combinations. 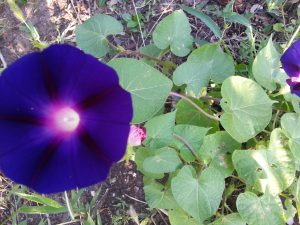 I only have a photo of a purple morning glory. Nigella/Love-in-a-Mist – annual flower with interesting flowers and seed pods, reseeds. Also in white and pink. The edible black seeds which resemble onion seeds are also called Black Cumin. 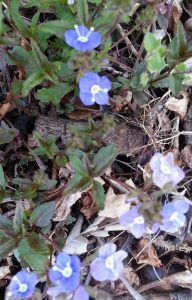 Creeping Phlox – all labeled “blue” turned purple in my yard. Maybe they would be purple elsewhere. I would like to add sulfur to acidify the soil and see if they would look more blue. Also available in white, pink, and purple. 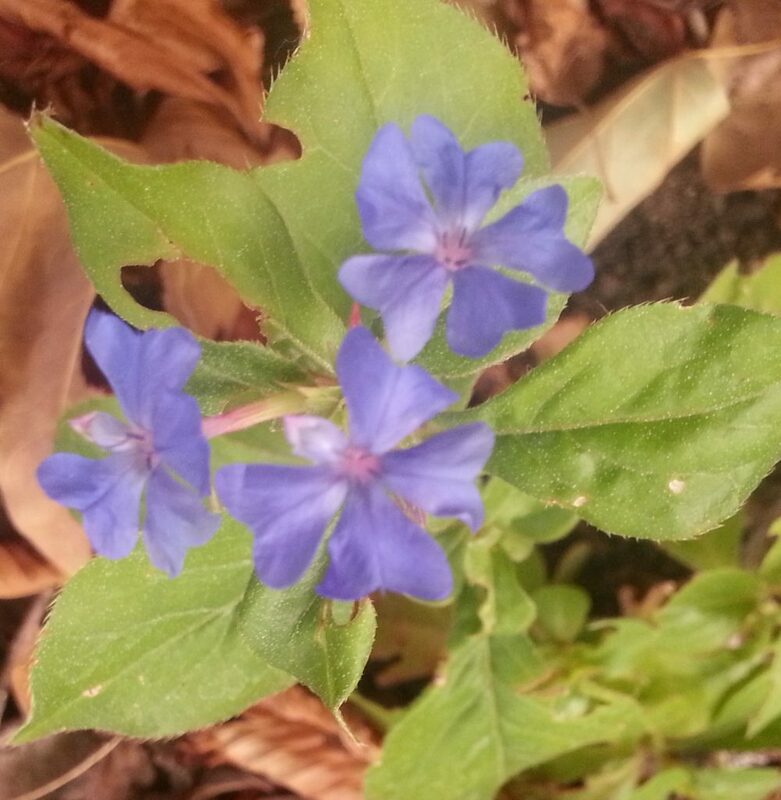 Plumbago – blue flowered groundcover has green foliage with sometimes a bit of red. Rosemary – has lovely blue flowers though depending on your climate you may not see the blooms often. The leaves are still delicious in cooking and add a wonderful scent and muscle relaxation when some are thrown in the bath water. 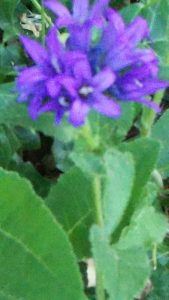 Salvias/Sages – among the perennial Salvias the bluest flowers I have seen are culinary sage which is famous as the seasoning for turkey stuffing and the more decorative but edible relatives including TriColor sage due to its leaves of purple, green, and white. Some of the annual but not edible salvias also have blue flowers. 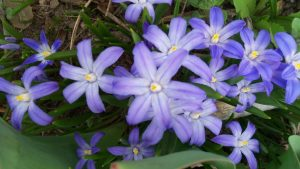 The rest have more purplish blue flowers or flowers of white, red or pink. 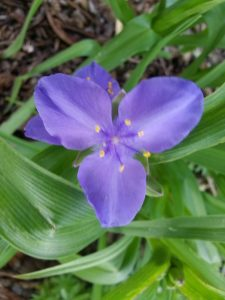 Spiderwort – cobalt blue or purples, pinks, or white. This unique flower is another of my favorites. Veronica – one of my favorite flowers – especially the lower growing groundcover types. Also comes in white and blue and white. The spike type of veronica is also available in pink. Violets and Pansies – blue or purple, white, yellow, and other colors alone or in combination. The flowers are also an edible edition to the salad or or fresh dish. If you choose to create a blue flower garden or want to add a splash of blue I hope this will give you some inspiration.